Hippie clothes. Bohemian clothing. Handcrafted by artisans in India, these are beautiful one of a kind Indian embroidered pouch purses embellished with shisha mirrors. Drawstring closure.These little purses are perfect when you want to travel light. Falls about hip length when you wear it over the shoulder. 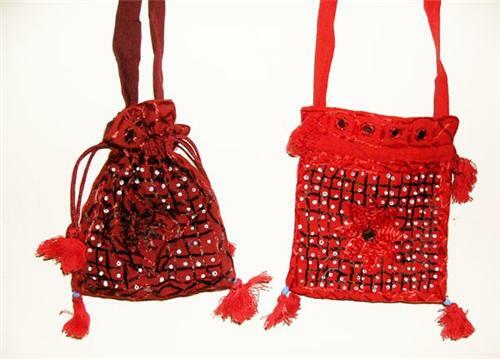 Because of the handmade nature of these purses, no two are exactly alike and therefor will differ from the picture a bit. The item you receive will NOT be the exact item in the picture.